Gabe Zichermann and Christopher Cunningham: Gamification by Design. Implementing Game Mechanics in Web and Mobile Apps. O’Reilly, Sebastopol 2011, 169+xix pages. 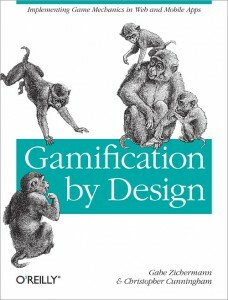 In the course of but one year, “gamification”, the use of game design elements in non-game contexts, has managed to grow from a self-description used by some vendors and proponents to a placement on the Gartner hype cycle – and in the IT business, it doesn’t get much more ‘official’ than that. Yet the term still stirs hot debate. On one side, game designers and scholars despise the whole notion as an “inadvertent con” (Margaret Robertson). On the other, proponents counter that gamification already ‘delivers’ (in terms of numbers), yet is still in its infancy. Hence it would be premature to call foul on something so young, with no time to learn from failure and sort wheat from chaff. So who’s right, who’s wrong?